Instagram has come very far. Back in 2010, it was launched as an IOS exclusive. Today, it is enjoyed by over 250 million monthly users, making it the 6th most popular social networking site and application. Instagram’s niche hangs on video and picture sharing. Its main focus has always been to give users the ability to tell their stories through static and dynamic images; the accompanying caption text is secondary. However, users are only allowed to see but not save the content that they enjoy on Instagram. This forces Instagram to be an almost ever-present conduit that dictates how you see and stream content. If you want to download Instagram photos or videos, you can always take a screenshot or record your phone screen, right? These are not very sophisticated methods though. What if you want to save images in the resolution and quality they were uploaded in? 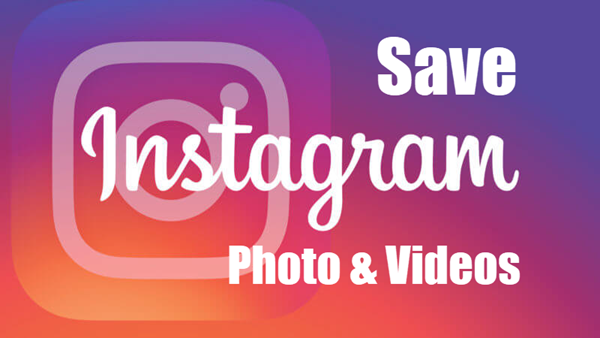 Well, like most things, there is an Instagram video/photo downloader app for that, as a matter of fact there’s more than just one and we’ll be showcasing a few of the best in this list. Inst Download provides a user interface that is very similar in look and feel to the Instagram application. It is light weight and has no ads. 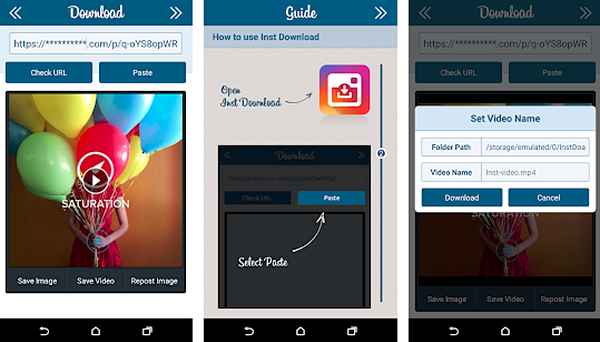 Although it is very simple to use, it still gives the user a handy guide on how to download Instagram videos and photos on Android, so as to make sure that downloading your pics and videos goes as smooth as possible. The application is segregated into three parts: Guide, Download and Recent. Unlike most other Instagram downloader apps, this app allows you to preview the video or image you’re downloading. It also allows you to get the default Instagram URL or open URLs directly in Instagram. Another feature that it lacks for the better is a background service. You just need to copy and paste your URL directly into the application and it does the rest. 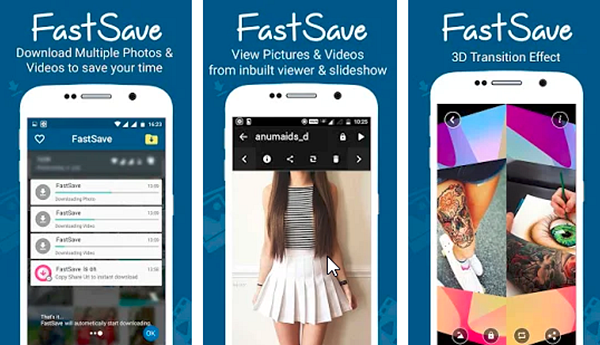 Video Downloader offers the user a simple and easy to use interface. It allows you to copy hashtags from any Instagram post. You can choose whether or not to download the video cover image when you’re downloading Instagram videos. Don’t let the name fool you. Not only does it allow you to download Instagram videos but it allows you to download Instagram photos too. You can also use this app to repost pictures and videos on Instagram. The app comes with over 20 languages. You can set where you want to download the videos or images on your phone. The developers are very open to communication. You can request new features or give them feedback. We highly recommend this app. 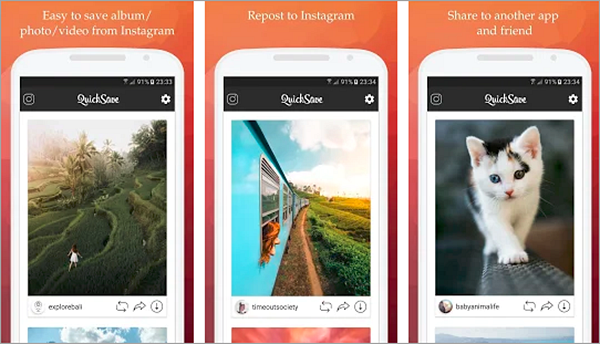 Formerly known as Instasave, QuickSave has a dynamic user interface with a colour palette that is nearly identical to Instagram’s. Although easy to use, it still provides you with a comprehensive guide that can be accessed within the application. If this isn’t enough then you can always watch the demo videos on Youtube. Quicksave has a service that monitors Instagram and your clipboard for links and shares. You can choose to start and stop the service whenever you want. Not only can you download multiple videos and pictures from Instagram but you can also share and repost them. Quicksave also comes with an autosave functionality. If you’re looking for speed, Quicksave is ideal. Unfortunately, it comes with ads. You can always upgrade to the premium version if you want to support the developers. FastSave works similarly to QuickSave. You can go as far as saying that FastSave is a QuickSave doppelganger but there are a few differences. FastSave offers you a truly stunning user interface that is both eye catching and minimalistic. It allows you to launch Instagram while providing you with a service that monitors your clipboard as well as IG. It delegates a section where you can peruse through your saved files. It separates this section into two parts for videos and images. You can rename and edit files in here. You can also play videos directly from the application. Unfortunately, it comes with ads and they’re not very inconspicuous. The user interface of Saver Reposter may seem clunky and cluttered to some but it gets the job done regardless. Saver has an auto detect function that detects URLs in the clipboard. If any of those URLs are Instagram URLs then Saver downloads Instagram photos and videos automatically. Users can choose whether or not they want Saver to display a shortcut in the notification bar. 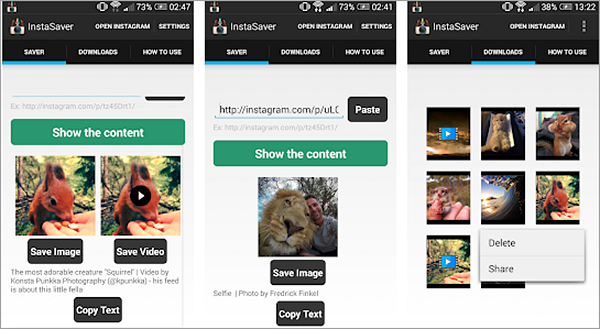 Saver allows you to launch Instagram from its main user interface screen. You can also add credits to photos that you download with Saver. Saver provides users with a simple help guide to ensure that using the app is as easy as possible. You can preview and play videos before downloading them. It also has a download management screen. Unfortunately Saver comes with some very intrusive advertising. Despite this, it is still worth the download. Tip: It must be frustrated if your downloaded Instagram photos and videos are lost due to some reasons. Fortunately, you still have chance to recover deleted photos from Android mobile with this Android Phone Recovery. Since Instagram still has limitations, there will always be a need for third party applications that allow you to view, share, post and download videos and photos from Instagram. 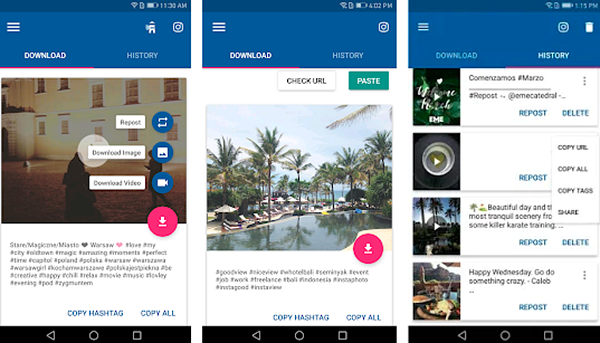 I hope you find this list of the best 5 Instagram video/photo downloader apps useful. If you want to add to it or point out any blind spots, please do not hesitate to comment below.